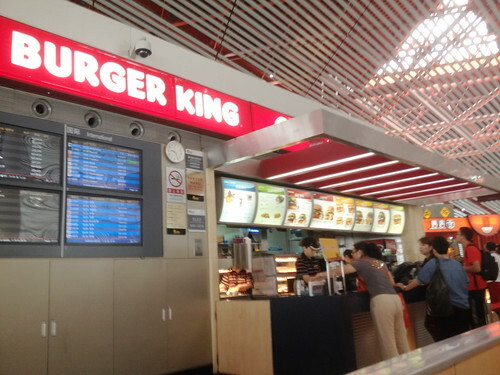 This is the Burger at Terminal 3 of the Capital Airport. I had a noon flight back to HQ and decided to pull in for a quick lunch before I board the plane. Yeah. I still think airline food is inedible, especially domestic flights. 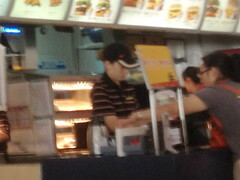 That's a picture of the BK staff that took my order. While it may be strange back home to be asking about the option of cheese, it must be understood that cheese is not as popular here as overseas. She became slight annoyed and asked again. Louder. "加芝士?" Liew. You annoyed. I also annoyed lor. Again. I also louder. "加!" Then she buay tahan already and lagi louder and clearer. "在这吃??!!!?" Walan!!! Your bladdy northern accent so thick lor..... How I know you asking if I eating here instead of taking out?? I thought you asking if I want cheese in my burger lor. Arrenn: English accents are no better if they are laying it thick. I remember back in NTU, I had a lecturer who had such a thick West Asian accent that I gave up attending his lecture since I saw no point going if I can't understand a single word he is saying. HAHAHA.. I literally LOL at this hilarious conversation!! LOL!! good one, you just made me laugh! haha! Mystique: Wow.... haven't heard from you for a long time! Good to have you back!